Apex (Combo Company of Canada) Although Apex was a separate company from Pathé they traded masters. electrical recordings (called Pathéphonic in the press, but not on the labels), and dubbing was finally abandoned." Perfect counterpart survived until 1938, the Pathé label was discontinued in the United States in March 1930. In fact, Annette would finish out her career on the Perfect label after it was merged with the American Record Company. The recordings that Annette did for the Harmony and the Velvetone labels would be some of the most prolific of her career. However, recording for the Harmony and Velvetone labels would still be done with the acoustical recording process. 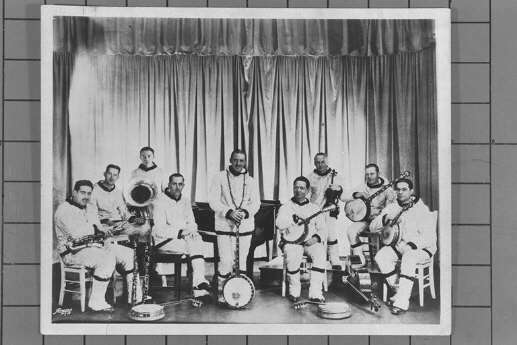 Although Columbia would start the electrical recording process with its premiere "Columbia" label in 1925 it would not start its electrical recording for its "dimestore" Harmony and Velvetone labels until 1929. As if to add insult to injury, Columbia started giving Annette a number of pseudonyms to "hide" her identity from the public. Although, they thought they could hide her identity from the public it was probably one of the worst kept secrets in the recording business and I have seen trade publications indicating the various recording pseduonyms that Annette would use. Pseudonyms were a sign of the times and were used by record companies for many, many artists to improve market share. Annette would record one song and that master tape would be released as "Dot Dare" on one label, "Patsy Young" on another label and still overseas that same master would show up as "Janet Shaw" or "Ethel Bingham" or "Marion Lee or Betty Lloyd." were released as by "Gay Ellis" or for the Helen Kane records, by Dot Dare. 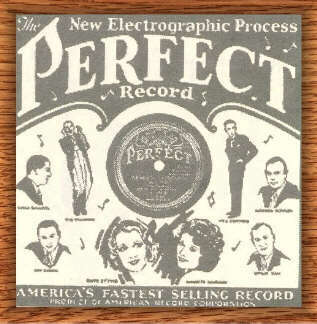 The third and final phase of her recording career would be with the American Record Corporation where we start to see Annette showing up on the Banner and Oriole labels starting in August of 1932 and running until February of 1934. This time was not as prolific as the early years but this was because she was also very heavily into radio. Annette Hanshaw Interview: "The Entertainers"
Annette's family was more middle class rather than well to do, Annette's father Frank Hanshaw was a clerk and then a saleman until she was 13, tried farming, and then ran a succession of small guest houses and hotels (particularly noted for their dining facilities presided over by Mrs. Hanshaw) with mixed success. At the time of his death when Annette was 25, Mr. Hanshaw was the manager of a businessman's club, and his estate was reportedly negligible. Reportably Annette was self taught. Her father would teach her a few chords and she would take it from there. (Quote from Annette: The Entertainers) She seemed to have the knack for singing as her mother told that even at 16 months old she could sing the choruses of at least twenty poplular tunes of the day. Annette gave her mother the credit for making her a successful artist. Annette would later remember that at the age of 3 her mother had her do her first public recital on a chair in the parlor. A lollypop was her reward for singing "The man in the moon". Even before she was 15 she was offered two musical sholarships but turned them down in favor of studying art. She had no designs on a musical career but did learn how to play the piano and the ukulele well enough to accompany herself. Her father had several roadhouses in upstate New York where he encouraged her to sing to the guests. It was also at this time that her father set her up with her own record shop, "The Melody Shop". She could listen to the songs of the day and practice her singing for the guests at her father's parties. (The Entertainers) It was at one of these parties that she was discovered at the tender age of 24 by the music director of Pathe’s records. The executive, a Mr. Herman Rose, heard her singing and convinced her she had talent. From John Woodruff: Herman Rose has been described as "an A and R man from ...Pathé", the musical director of Pathé records", "record producer", and later "in charge of the recording laboratories of [Velvet Tone] and "recording manager of [Velvet Tone]." His other involvements (i.e. not associated with Annette) in the recording industry seem to tend toward the technical rather than the artistic side. I have never seen any authoritative statements on how much he had to do with the musical content (e.g. selections, arrangements, choice of accompanists) of any of Annette's recordings, other than his encouragment of her continuing use of "that's all" to end them. Mr. Rose was a remarkable man and was probably the reason for her whole career. He saw a talent for singing and set up Annette for her first audition with Pathé. He later became her manager and then her husband. He first met her at 24 and married her 3 years later when Annette was only 28 on June 12, 1929. Such devotion can only be described as love because the talent that was arranged for hear reads as a who’s who of jazz in the late twenties. Notwithstnading John's comments about "hard evidence" about how much he had in the arrangements, I don't think it was simply by chance that on Annette's first record she recorded with Red Nichols and Miff Mole! He discovered her, he became her manager and then he married her! And what a job her did for her! Lanny Ross would later say about Wally "that he was always there for her, at every one of her recordings" (The Enterntainers). She was probably scared to death. On her first test pressing for Pathé you can hear her say, "I'm not doing so well, I am all a quivering". Imagine how she felt when she had to make her first record with Red Nichols and Miff Mole! But even on some of her first recordings something was apparent. She could mimic, she could laugh, she could carry a tune with personality and she could become part of the band. In essence she could carry her voice as another musical instrument. Tommy Dorsey once said of her that she was a "musician’s singer". Maybe it was because of her shyness, her character, her desire to get the tune just right that they ended up doing 4 or 5 takes on many tunes. Nevertheless, the musicians loved her. At the time there were many good jazz musicians but very few good jazz singers. To have the musicians love her was probably her greatest asset. When Pathe records went into reorganization (merged with Cameo Records in 1928-(Sutton and Kauck)in late 1928, Mr. Rose set her up with Columbia and it many subsidiaries. This was a strange period for her as she could have been very popular but because Columbia had contracts with many different stores she recorded for each store under a different pseudonym. She was called Patsy Young, Dot Dare, Gay Ellis each name for a different company. It was in the period of recording for Columbia that Annette really blossomed artistically and got to sing with some of the greatest musicians of the day. There was Red Nichols, Miff Mole, Adrian Rollini, Joe Venuti, Eddie Lang, Benny Goodman, Jack Teagarden and the Dorsey Brothers. In one stint the Dorsey Brothers played with Bing Crosby in early 1929 and then just a few months later played with Annette. 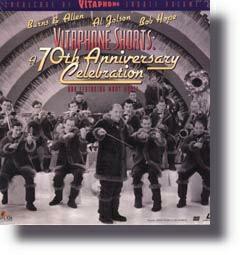 It is somewhat ironic that Bing and Annette did not play together as both recordings were done in New York. As her recordings became more popular she started blossoming out into radio in the late twenties. Her first big show was the Van Heusen Radio Program on CBS. Then she did an 101 week (Woodruff) stint with the “Maxwell House Showboat” radio show and then a 39 week (Woodruff) stint with the “Camel Caravan” with the Casa Loma Orchestra. On the Maxwell House Showboat she recorded her only video. It is a short 10 minute film where she sings, "We just couldn't say goodbye." Had she the desire she probably could have been more famous, perhaps more famous than Bing Crosby. She had all the same musicians. But she tired of show business and except for a few radio shows retired in the late thirties to settle into married life with Mr. Herman Rose. After Mr. Rose died she began volunteering at a St. Agnes Church in New York City where she had many friends (Roy Evans-1993). 3-10-1926 Local Radio Show on WGHB, Clearwater, Florida. She was 24 at the time. 1-10-1928 Guest appearance on the "Everyready Hour"
February 19, 1931 (woodruff) Appeared on the "Radio Roundup"
October 21,1931 Appeared on the "Vitality Hour"
October 6, 1932 Appeared on the "Maxwell House Showboat"
November 1932 Appeared on the "Maxwell House Showboat"
January 1933 Name of the "Maxwell House Showboat" starts to show up as "Captain Henry's Showboat" also. from Woodruff: I believe the agency's name for the program was 'Captain Henry's Maxwell House Show Boat' (see for instance in the Maxwell House coffee ads in the 'Saturday Evening Post'), but the program was most often referred to in newspapers (particularly in the program listings) and elsewhere as 'Captain Henry's Show Boat' and only sometimes as the 'Maxwell House Show Boat' . 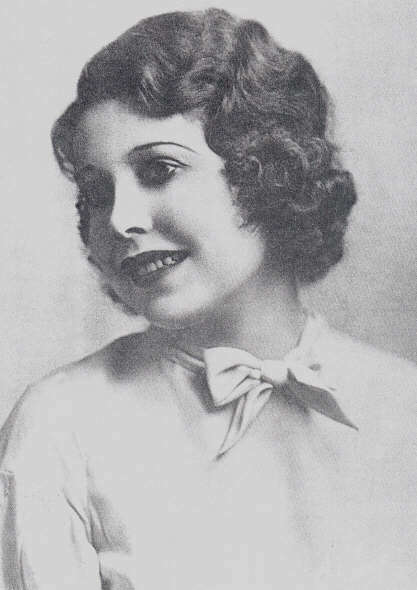 She appeared on this show each Thursday until her last program on September 13, 1934. There are references to her specific shows on October 12, 1933, January 11, 1934, July 19, 1934 and her final show on September 13, 1934. The 'Rexall Magic Hour' was a transcribed series of 5 programs featuring Annette which was broadcast in different cities on different dates, corresponding to the local Rexall stores 'five cent sale' week. For example, the series was broadcast the week of October 29, 1934 in New York, and the week of November 13, 1934 in Washington D. C.
October 2, 1934-July 2, 1935 (woodruff) Camel Caravan Show-Annette signed on the Glenn Gray's Casa Loma Orhcestra to appear twice per week. (tuesdays and thursday). 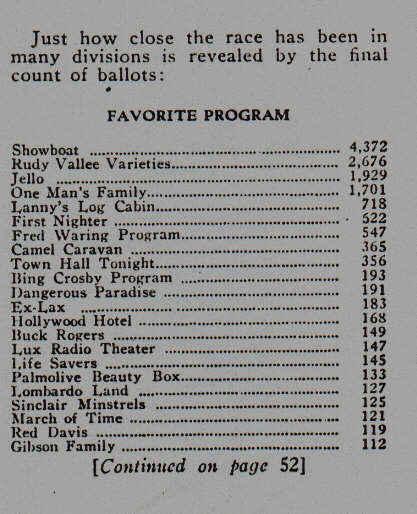 from John Woodruff: "The 'Norge All-Star Varieties' show was a transcribed, syndicated series (as far as is known, Annette was only on the first of 39 programs in the series) that was broadcast on different dates in different cities. It was broadcast in Philadelphia over WCAU from 9:15-9:30am starting on March 15, 1937, and in New York over WOR from 11:30-11:45 am on March 16, 1937. 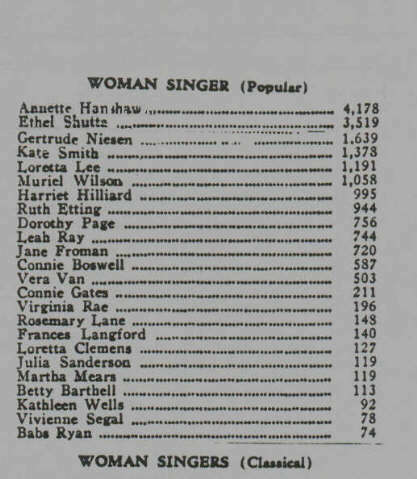 August 3, 1937 Reported to have aired her own radio program. from John Woodruff: A program broadcast over WMCA, New York on August 3, 1937 is simply shown in the program listings as 'Annette Hanshaw and Barry McKinley' , and is quite possibly a re-broadcast of the 'Musical Moments' transcription boradcast over WOR the previous evening. December 6, 1937 Reportedly appeared in the "Chevrolet Musical Moments Program" transcriptions. 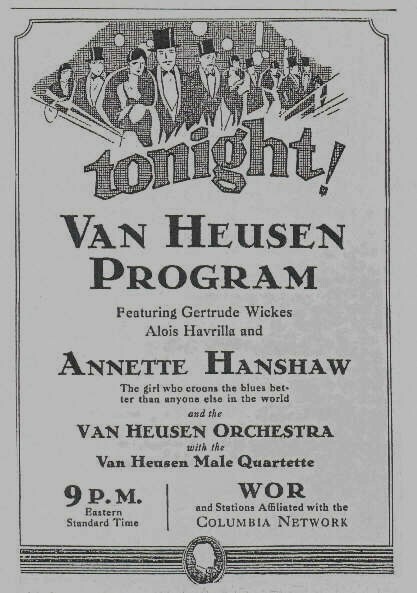 from John Woodruff: My reference to the re-incarnation of the 'Musical Moments transcriptions that began broadcasting on December 6, 1937 states that "Victor Arden is bringing Annette Hanshaw back to radio as one of the many guest stars", but doesn't say she is on the first program, and the newspaper listings I have seen for that date simply say 'Victor Arden Orchestra'. 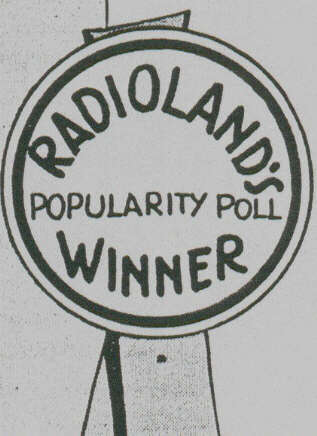 I know of three other radio programs on which Annette appeared that are not on your listing: She appeared on the 'Best Foods Program' , with Billy Jones and Ernie Hare, an unknown number of times (perhaps as many as 11) between October 14, and November 30, 1932 (the 15 minute program was broadcast 3 times a week)...she appeared as 'Gay Ellis' on the 'Cliquot Club' radio program weekly from January 23, through April 24, 1933; and she was a guest on the 'Lum 'n' Abner Friday Night Sociable on November 17, 1933. Below is an article from Radioland magazine from 1935. It is courtesy of Preston Meeks. It has the results of the poll it took of its readers. 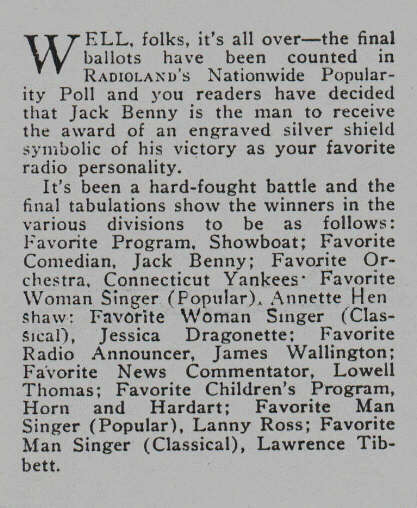 They overwhelmingly chose Annette as their favorite singer and "Showboat" as their favorite show.